We shall now move on to the bane of Florida waterways all over the state (s). 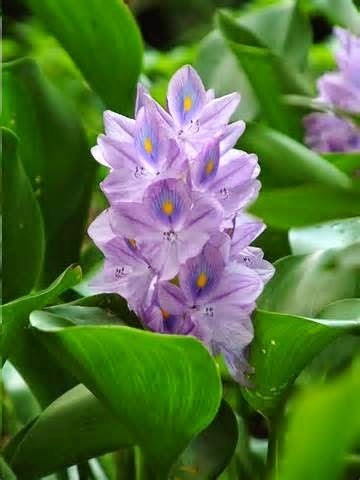 The lovely, yet “deadly” water hyacinth. This plant is not native to the USA, much less Florida. The plants were brought in, much to our dismay, as “gifts” from the Japanese in 1884 during the World’s Fair in New Orleans and soon took over, clogging rivers, killing fish and putting a halt to shipping in Louisiana for awhile. 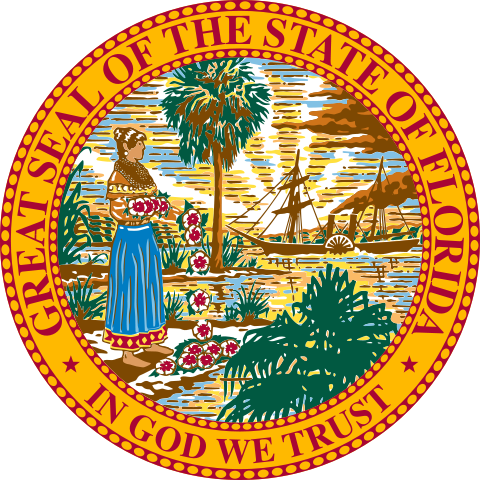 By this time, according to Wikipedia, there were over 50 Kilos per square meter choking Florida’s waterways. Behind glass in an aquarium, yes. 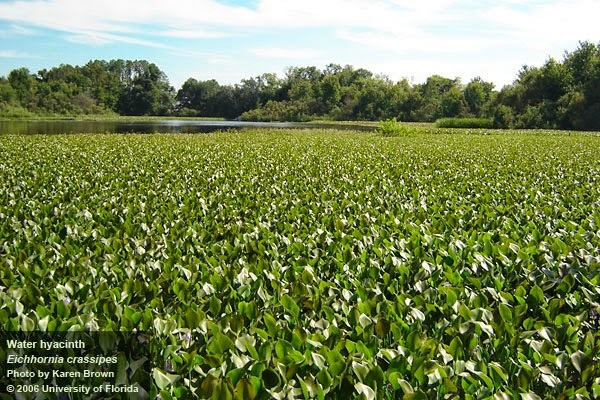 Now, it seems, perhaps a real use for water hyacinth may be in the works. Biomass. I say, let’s make hyacinths work for us for a change! I wonder what the ‘gaters and manatees would have done if the bill had passed and they’d had to live with hippos stomping up their territory. I'm not putting a canoe in that water. Don’t want to imagine having to look out for hippos when canoeing down the Suwannee River or any other river for that matter. 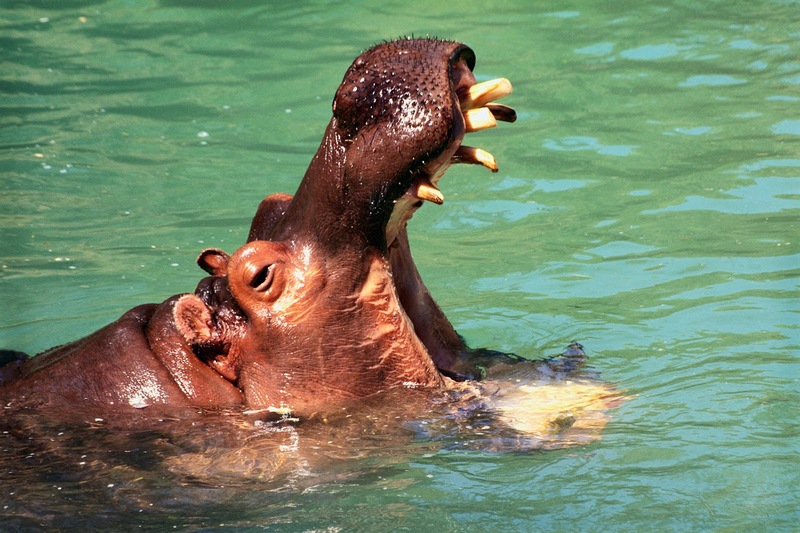 Love bugs and hyacinths as invasive species are one thing, but hippos? No way! Now if they all looked this cute and stayed this small...! Releasing non-native flora and fauna into what is effectively an alien environment, generally with no natural controls, rarely if ever goes well. Isn't it amazing what crazy ideas politicians can come up with? I love hippos... they are cute, yet huge... like the one from Disney's Fantasia... dancing. 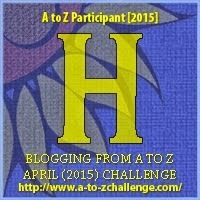 What a wonderful post and a double H to boot! One of the wackier ideas like introducing cane toads to Australia. The message is NEVER mess with nature. Hippos are really dangerous animals, more so than alligators. They probably would've caused more problems. I wonder why the manatees don't eat the plants? 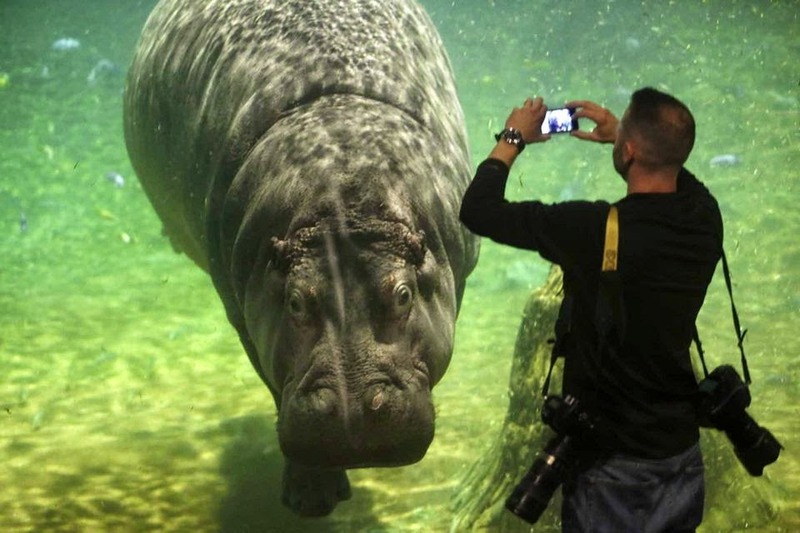 Hippos are considered one of the most dangerous animals in Africa and they wanted to release them in Florida - really? What a mess! Invasive species are everywhere, too. I think of the Asian carp in the Illinois River and the nutria rats in the South. I live in Florida and did not know that about Hyacinth. 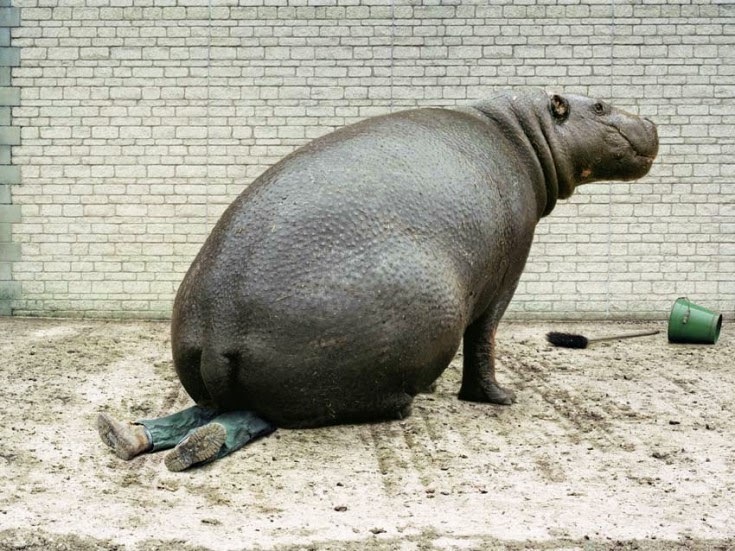 Is that hippo really sitting on someone? That last one, the baby hippo, is adorable! There are lots of wild hippos in Columbia thanks to Pablo Escobar bringing them in. Hippos. 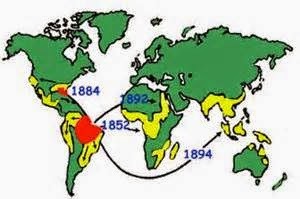 In South America. That might have caused a big problem. Then I can see a law enacting hippo hunting season. I was wondering how in the name of all that is sunny and bright were you going to close the loop on Hyacinths and Hippos... and then my jaw dropped... ONE vote shy... wow!! Every time we "introduce" something to take care of a problem, we cause more problems. I am glad the idea of using the hyacinths for something useful is in the works. The fragrance of hyacinth is so lovely, I had no idea it was such an invasive plant. I want a hippopotamus for Christmas...they're just too cute, and I always think it's interesting when we find innovative ways to solve problems using plants and animals. Wouldn't it be something if it turns out oil was actually made from long ago hyacinths. 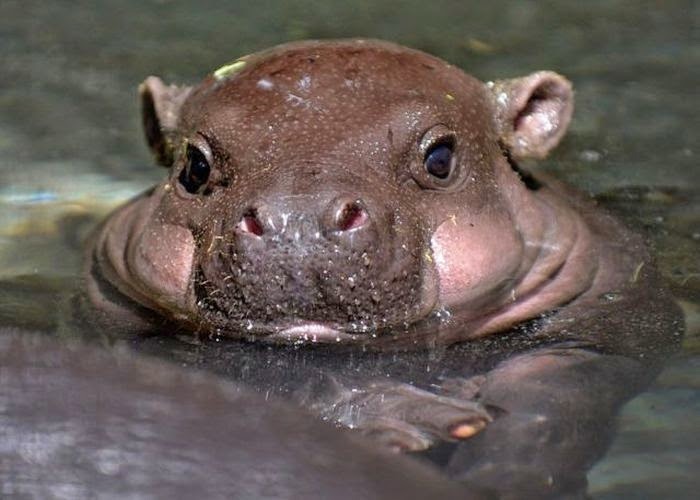 That baby hippo is simply adorable! Hippos would not have been a good idea. As it is you now have huge python making their homes in the Florida swamps and they certainly were not native. As someone mentioned, introducing a species into a different environment has proved to be a bad idea time and time again. I hope the alternate use for the water hyacinth works out well. Wonderful article Lisa. Just learned something new, had no idea. Thank you for expanding my world. Wow I never dreamed there was a time when people wanted to introduce hippos to Florida. I can't imagine! I've also read the same thing Alex mentioned, that they are actually very dangerous animals. I always think of them as just fat and happy but clearly appearances are deceiving. Non-native species? Wild. Hippos? Crazy. It's like the stink bugs that invaded Pennsylvania a few years ago. There is supposedly no known predator except I've witnessed a wild turkey take down all of them in his reach. But that doesn't stop us from hunting wild turkeys. Go figure.